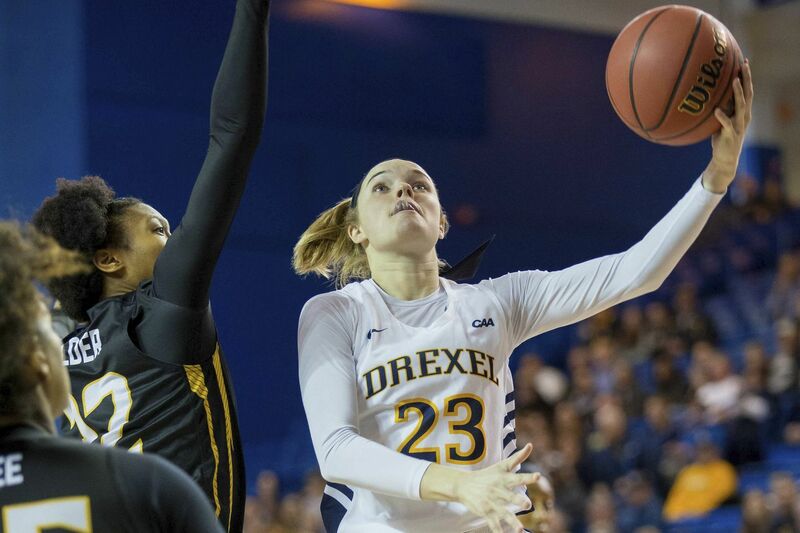 Bailey Greenberg and the Drexel Dragons have earned a spot in the WNIT. Three local teams will continue their seasons this week when the Women’s postseason NIT tips off on Wednesday. Penn earned an automatic bid after finishing 23-6 during the regular season. They’ll play American on Friday at the Palestra. The Quakers came within one game of an NCAA Tournament berth, but lost to Princeton in the Ivy League tournament final on Sunday. With a 12-2 conference record, Penn was the highest finisher in the league that didn’t make it to the NCAA Tournament. Drexel (24-8) and Villanova (18-12) both received at-large bids to the 64-team field. The Dragons finished the regular season with a 14-4 conference record and earned the No. 2 seed in the Colonial Athletic Association postseason tournament. They beat Northeastern to advance to the championship game, where they lost to Towson despite a team-high 15 points from Bailey Greenberg, an Archbishop Wood grad and the CAA player of the year. They’ll travel to Harvard fora first-round matchup on Friday. Villanova is one of five Big East teams to earn a spot in the WNIT. The Wildcats were the No. 5 seed in the conference tournament but couldn’t get past Georgetown in their first game, a quarterfinal loss on March 10. Villanova will host Old Dominion on Friday. Game times will be announced on Tuesday. The first round will be played Wednesday through Friday, with the fourth round running Saturday through March 26. The tournament culminates with the championship game on April 6.